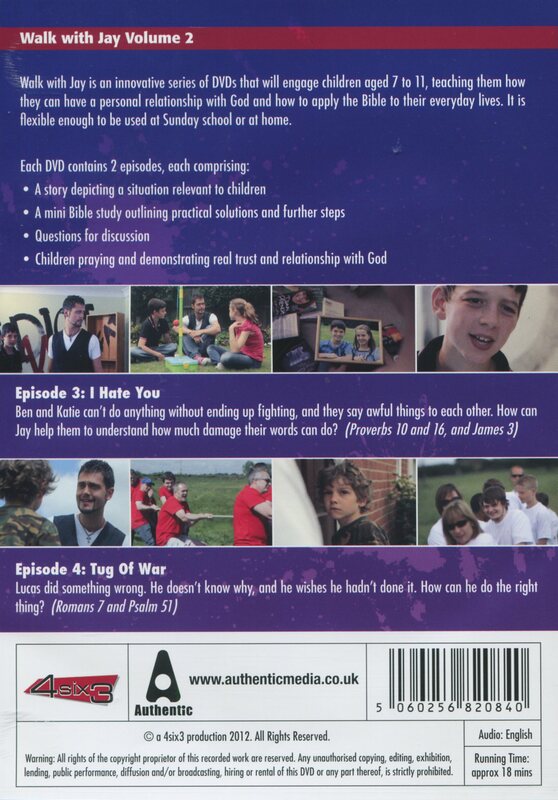 Volume 2 of 3 I Hate You & Tug Of War is a 2-episode DVD from 4six3 which teaches children how to have a personal relationship with God and how to apply the Bible to everyday lives. Walk with Jay is a series of DVDs for children aged 7- 12. Over the series children can learn about having a two-way conversation with God, and how the Bible is relevant to them as well as adults. They are taught how to tackle issues that can come up in any child's life, like arguing, feeling lost and alone, and being left out of things. A recurring theme is what happens when we do something wrong, how that hurts God, others and ourselves, and how to try and put things right. Walk With Jay: Volume 2 by 4six3; Sarah Robinson; Nick Willoughby was published by Authentic in February 2013 and is our 22770th best seller. The ISBN for Walk With Jay: Volume 2 is 5060256820840. Be the first to review Walk With Jay: Volume 2! Got a question? No problem! Just click here to ask us about Walk With Jay: Volume 2.